Darien Community Association is making improvements in its four-acre bird sanctuary on Middlesex Road, with help from a $18,500 grant from the Darien Foundation. 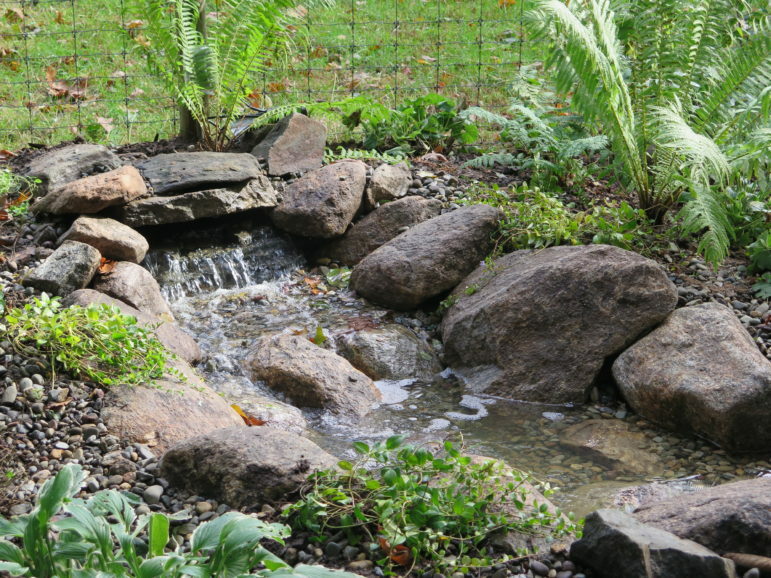 These include a pondless waterfall for the birds and butterflies, as well as additional trees, benches and equipment. This second round of grant funding will improve the sanctuary’s ability to attract birds via the availability of cascading water (now installed), and the new trees will provide additional cover and food. The cascading pondless waterfall at the DCA Bird Sanctuary is meant to attract birds and butterflies in season. After planning, consultation with experts and with funding from the DCA Board of Directors, DCA volunteers launched work on the bird sanctuary in 2011: clearing invasive plants, establishing walking trails, and planting native bushes attractive to bees and butterflies. 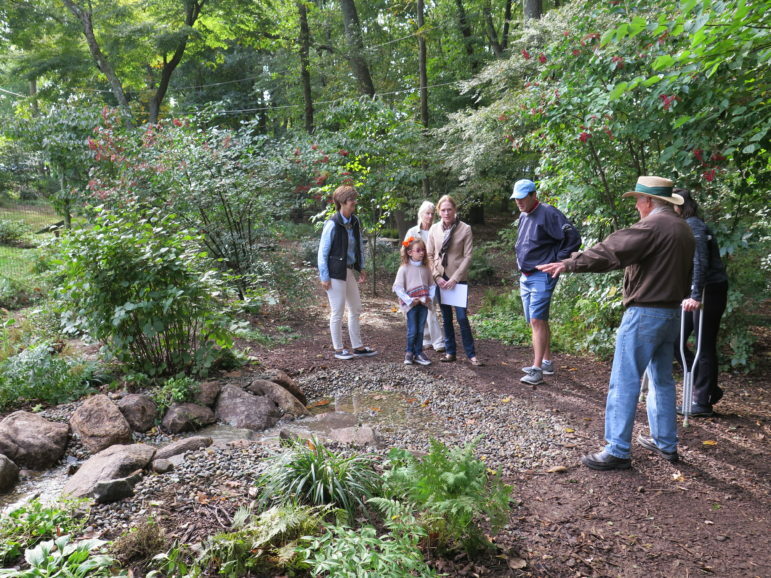 The goal was to build a successful, authentic bird sanctuary and native plant garden, with shelter, food, water and nesting sites for birds — so that the DCA could play a part in helping to restore native plant and declining bird populations, while also providing the community a beautiful open space as well as an opportunity for wildlife and conservation education. “The Darien Foundation provided significant funding to the DCA in 2013 for deer fencing, since protecting native plantings was essential for the success of the sanctuary,” said Darien Foundation Executive Director Sarah Woodberry. Chris Filmer describing the new pondelss waterfall on a tour of the DCA Bird Sanctuary. The DCA Bird Sanctuary is child-friendly (totally fenced-in) and features well-laid winding trails. It is open daily from sunrise to sundown. The sanctuary also has numerous educational features and activities for children, including a stump walk and rock spiral. 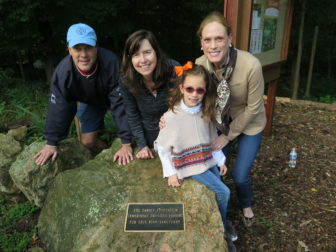 Ward Glassmeyer, chairman of the Darien Foundation Board; Sarah Woodberry, executive director of the foundation; Catherine Gies; and Brooke Gies, a board member of the Darien Foundation, at the plaque commemorating the two grants given by the foundation to the DCA Bird Sanctuary. The DCA has hosted over 200 school-aged children on sanctuary tours, in addition to numerous adult groups. “The sanctuary is a retreat and learning space for the community — free to enter and enjoy for all, what a gift,” said Mallory Arents, Associate Director of Programs and Services at the Darien Library. 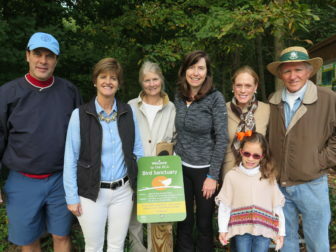 Ward Glassmeyer, chairman of the Darien Foundation Board; Amy Bell, executive director of the Darien Community Association; Cindy Ryan, DCA Bird Sanctuary volunteer; Sarah Woodberry, executive director of the Darien Foundation; Brooke Gies, board member at the foundation; Catherine Gies; Chis Filmer, DCA Board member. The Darien Foundation provides grants for technology and capital initiatives which benefit and create opportunity for Darien’s youth, support our town’s safety and security services, and enhance the overall quality of life in Darien through collaboration with community organizations. The DCA is only one of many local groups who have benefitted from their generous funding. Since its founding in 1998, the Foundation has awarded more than $4.2 million in grants to the Darien Public Schools, town emergency services, and local organizations.